At a distance of 4 KMs from Vizag Railway Station, Rama Krishna Beach (also called RK Beach) is a spectacular long beach on Bay of Bengal. This picturesque beach is the extension of the Coromandal Coast of India. 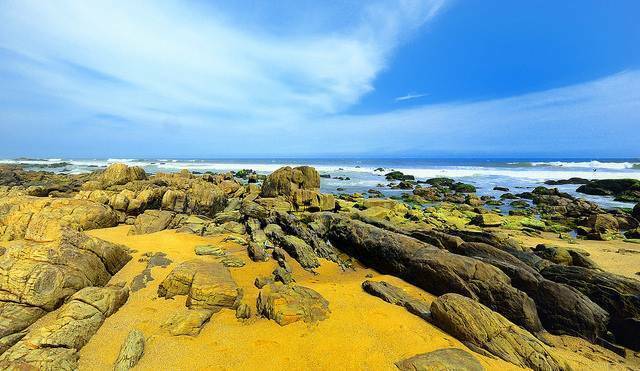 Favorable for sunbathing and surfing, the R.K Beach is a great picnic spot to spend time with your loved ones. Swimming, and beach volleyball are popular activities on the beach. The Ramakrishna Mission and an imposing Kali Temple are located near the beach. Another major attraction here is the Aquarium, which will soon be upgraded into an Oceanarium. From the harbor, you can take cruise for Andaman and Nicobar Islands. Apart from all this, Deep sea angling is another prominent activity which you can do by taking a ride in the traditional fishing boat and asking the fisher folk to arrange it for you. To reach the place, onecan catch up a bus run by the APSRTC to reach the beach. You can also ring for a Tourist Cab or a pre-paid cab so you can start from the place you stay.